Follow us @thestreetdogcoalition for more (p)updates. In conjunction with Redtail Ponds Permanent Supportive Housing (PSH), our Fort Collins SDC team will be administering free veterinary care to pets of those who are currently homeless, near-homeless, or have experienced homelessness. Rabies vaccinations and an exam of minor medical problems are amongst the services being offered. Dogs and cats welcome. Exact time TBD. Dr. Aleisha Swartz and her dedicated vet tech, Sarah Krupp, are officially offering Street Dog Coalition clinics at the Punawai Rest Stop for the homeless in Iwilei. Click here for a great news story on the Punawai Rest Stop, located at 431 Kuwili Street in the neighborhood of Iwilei. Joey Manahan, the city council member who started the initiative to build the center, is very appreciative of the services The Street Dog Coalition is providing, and we are very appreciative of Aleisha and her team for making it happen! Keep up the great work. Our Des Moines SDC team will be moving between homeless camps on Sunday, April 28, so there is no specific address for this clinic. We are incredibly excited to add Chicago to the SDC map. Many thanks to Stacy Lempka for organizing the volunteers, managing the supplies, and coordinating with The Night Ministry (@thenightministry). The Night Ministry is a Chicago-based organization that provides urgently needed services to members of the Chicago community struggling with poverty or homelessness. With an open heart and an open mind, they accept people as they are and work to address their immediate needs while affirming their sense of humanity. On the last Monday of every month, our SDC team in Omaha, NE offers free veterinary care for pets of the homeless and near-homeless at Open Door Mission (Timberlake Outreach Center, 2107 E Locust Street). Rabies vaccinations and an exam of minor medical problems are amongst the services being offered. Dogs and cats welcome. 1pm to 3pm. On the 2nd Saturday of every month, our SDC team in Omaha, NE offers free veterinary care for pets of the homeless and near-homeless at Siena/Francis House Homeless Shelter (Baright Shelter at 1111 N 17th). Rabies vaccinations and an exam of minor medical problems are amongst the services being offered. Dogs and cats welcome. 9am to 11am. Free pet care for pets of the homeless and near-homeless in Houston, TX. The pop-up clinic will be located at Ecclesia Church (1100 Elder St. Houston, TX 77007). Open to cats and dogs belonging to people experiencing homelessness and newly housed individuals. Services include wellness exams, routine vaccinations, deworming, flea and tick treatment, grooming, nail trimming, pet food and other supplies, and veterinary hospital referrals/vouchers. On the 3rd Tuesday of every month, our SDC team in Las Vegas offers free veterinary care for pets of the homeless and near-homeless. The pop-up clinics rotate locations every month between Lutheran Social Services of Nevada one month, and Salvation Army the next. Rabies vaccinations and an exam of minor medical problems are amongst the services being offered. Dogs and cats welcome. 10am to 1pm. AVMA Convention Clinic in D.C.
AVMA Convention 2019 is taking place in Washington D.C. and The Street Dog Coalition is planning a street clinic on Sunday, August 4. We are in the process of setting something up at The Community for Creative Non-Violence, a 1,350-Bed Federal City Shelter that is the largest and most comprehensive facility of its kind in America. Stay tuned for more details. Fort Collins Christian Church "Service in the Park"
Planning on serving 125 people experiencing homelessness to help them get prepared for the winter months. Church service will be at some point during this event for 30-45 min. Completely optional for the healthcare providers/volunteers to join! We will be providing veterinary care to veterans’ pets at the annual Fort Collins Veterans Stand Down event on Friday, November 1, 2019 at First Presbyterian Church, 531 S. College Avenue. Winter gear, food, bike repairs, haircuts, and counseling services will also be available. Thank you for your service! WOW. 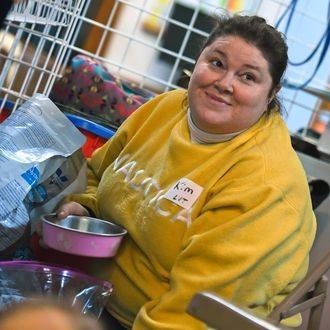 Our first Street Dog Coalition clinic in Amarillo, Texas saw FORTY dogs and one cat at Faith City Mission. If you're a numbers person, you'll love this: In total, our vets and volunteers administered 33 rabies vaccinations, 40 DAPPV vaccinations, 1 FVRCP vaccination, 23 heart worm tests, 24 Iverheart Plus prescriptions, 38 deworming treatments, 4 other prescriptions, 18 nail trims, and 1 ear cleaning. At one point, when vaccines were running low, a colleague was called and more vaccines were delivered. Teamwork makes the dream work. MANY, MANY thanks to everyone who helped, especially Kim Nethery and Pat Chase!! Let's do it again. Dr. Aleisha Swartz (left) and her dedicated vet tech, Sarah Krupp (right), are officially offering Street Dog Coalition clinics at the Punawai Rest Stop for the homeless in Iwilei. Click here for a great news story on the Punawai Rest Stop, located at 431 Kuwili Street in the neighborhood of Iwilei. Joey Manahan, the city council member who started the initiative to build the center, is very appreciative of the services The Street Dog Coalition is providing, and we are very appreciative of Aleisha and her team for making it happen! Keep up the great work. The Street Dog Coalition has a serious case of puppy love for these ‘lil roly poly mixed-breeds. In addition to de-worming, vaccinating, and trimming their puppy nails, the SDC team in St. Augustine, FL took care of five dogs and a cat at their FIRST clinic. They also talked to the owner of the puppies about responsibly rehoming them if they become too much to care for on his own. He was receptive to the discussion and will be returning to the Humane Society for their first da2pp shots and will revisit the conversation. If love is always doing what’s best for someone, even if it means letting them go, then this human is demonstrating that. The Street Dog Coalition is passionate about an inclusive "one health" approach to street medicine, and our team in Ithaca, New York is a great example of this. When a local doctor was preparing to open the harm-reduction medical practice called "REACH Medical" to treat drug users, her daughters questioned who would provide veterinarian care for the pets of patients who may be experiencing homelessness. Click here for a short article from the Ithaca Journal to learn what happened next. 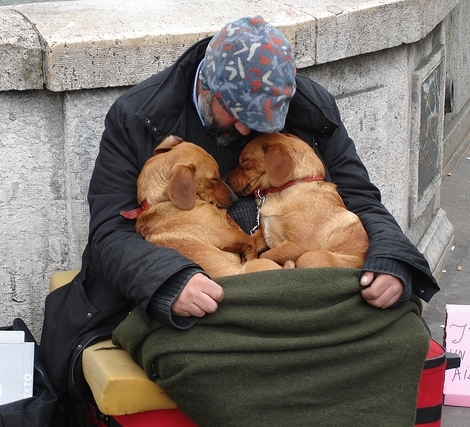 The Street Dog Coalition of Fort Collins partners with Homeward Alliance and the Murphy Center for Hope to provide free medical care and related services to pets of individuals and families experiencing homelessness. For a pdf copy of their 2019 Canine Companion Calendar, Home Is Where The Heart Is, click here.